Will Ferrell and company sure do know how to build anticipation for a movie. Apparently the book, titled Let Me Off At The Top! My Classy Life and Other Musings, will document Ron Burgundy’s entire life, from childhood to his exploits as an anchorman. 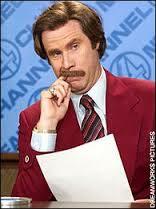 I have a feeling we’ve seen the last of Will Ferrell until Anchorman premieres December 20th. He’s 100% Ron Burgundy now. While I can’t see many other movies adopting this type of marketing strategy, one thing is for sure: no one transforms themselves into the characters they play better than Will Ferrell. Posted on August 14, 2013, in Average Blog Posts and tagged anchorman, autobiography, book, burgundy, CBS, cinema, ferrell, movie, news, ron, Will. Bookmark the permalink. Leave a comment.